Valentines Day Plans. Whatcha doin? Discussion in 'The Mainboard' started by DUCKMOUTH, Feb 12, 2019. Looks like we taking the kids to dinner so they have fun with it. We’ll let them pick. Then I’ll be eatin the wife’s booty later. What you got going on? Louis Holth, Dirt Dirt McGirt, sc_chant and 8 others like this. Taking my kids to dinner then eating your wife’s booty later. Louis Holth, Clown, Dirt Dirt McGirt and 29 others like this. and bye the way your friend told me you were one of them . imagin that you the sellout with good foranother ? when your friend told me that I said noway but damn if he wasn't right . so ! from now on if I in anyway find that you tag or talk for me in any way nothing is ot . .
sc_chant, Luka, marcus and 3 others like this. LSUTigers1986, Luka, Sterling A and 5 others like this. sc_chant, ButchCassidy, bhrangerfan0809 and 10 others like this. We're staying home and doing some sous vide new york strips, asparagus, and a snow crab and corn cob steampot in the Instapot. And afterwards as a surprise since my wife loves donuts we're gonna be making some WW-friendly donut recipes that I found online. Then if I play my cards right and get lucky my wife will go to bed disappointed while I continue my rewatch of all of GoT before the new season comes out. High Cotton, Wicked, Louis Holth and 12 others like this. High Cotton, Luka, tjsblue and 1 other person like this. Louis Holth, Clown, Dirt Dirt McGirt and 19 others like this. I'm single, unattractive, and cheap. Louis Holth, b0ne5, Dirt Dirt McGirt and 13 others like this. Homemade chicken alfredo...Like every year. We don't do valentine's day. Louis Holth, Dirt Dirt McGirt, Luka and 8 others like this. Dirt Dirt McGirt, sc_chant, Koby Salman and 6 others like this. Louis Holth, LeVar Burton, Luka and 3 others like this. Tiffin, Louis Holth, b0ne5 and 10 others like this. Louis Holth, AHebrewToo, Luka and 4 others like this. Clown, Dirt Dirt McGirt, 20/20/20/20 and 1 other person like this. I'm single, so planning on going to the gym that evening and finally get a definitive list of which hot cross fit girls are also single. Chocolate Giddyup, Tiffin, Dirt Dirt McGirt and 16 others like this. I haven’t had one yet but I bought my dad a sous vide and blow torch for Christmas. He’s making me a steak this week and I’m excited. Luka, One Two and skiedfrillet like this. Going out to an Italian restaurant. Luka, Boo MFer! and One Two like this. Luka, One Two and devine like this. bhrangerfan0809, Luka, Boo MFer! and 2 others like this. 5 course beer dinner tonight cause I'm working Valentine's day. Doing nothing so far, althought I purchased her a $250 pillow that better support the best sleep she's ever had. We don't normally make plans but my MIL volunteered to baby sit. We'll probably grab a drink and get dinner at a random spot then head home. My wife will make sexually related jokes on the way home then sit on her phone in bed until she says she's sleepy and has a long day tomorrow and goes to bed. Tiffin, LSUTigers1986, Louis Holth and 16 others like this. chopcity, sc_chant, bhrangerfan0809 and 4 others like this. Tiffin, Louis Holth, Dirt Dirt McGirt and 12 others like this. Luka, BudKilmer and One Two like this. Dirt Dirt McGirt, bhrangerfan0809, Luka and 3 others like this. Dirt Dirt McGirt, sc_chant, bhrangerfan0809 and 5 others like this. Wife is out of town. Therefore, I'll drink a lot of Titos. My local bar is having a "Single's Awareness Day" party on Thursday night. I may venture in just to see how that's going. For curiosity purposes. Lipp, Luka, Goose and 4 others like this. 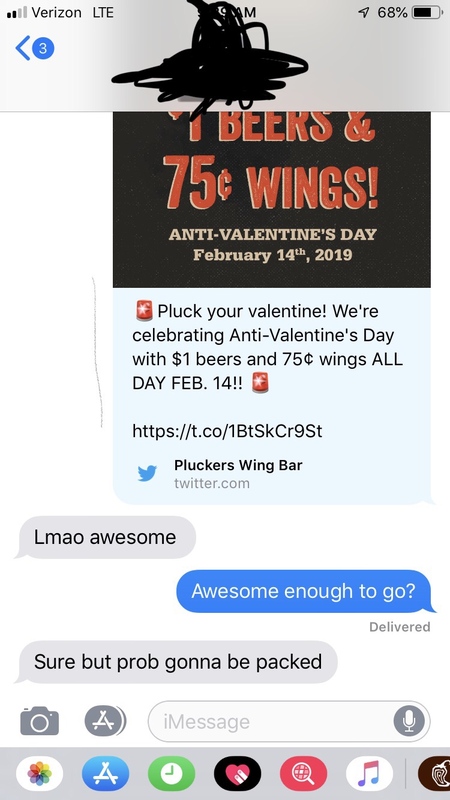 What do you have against cheap wings? Maybe I’ve been out of the wing game too long, but 75¢ hardly seems like a promotion. Isn’t that about average price? Tiffin, Luka, Owsley and 2 others like this. For a sports bar I would say $1 a wing or a little more seems like the usual these days. Luka, devine and BrickTamland like this. I have my kiddo every Wednesday & Thursday night, so just hanging out with him at the house. Buster, Lipp, Luka and 6 others like this. THF, Luka, bigred77 and 3 others like this.